Tostada con tomate – toasted bread with fresh tomato, olive oil and salt – was one of my son Mateo’s first foods. With his teeth barely poking through his gums, he would nibble away at bits of tomato toast while perched on his tita’s (aunt’s) lap in our neighborhood café, golden olive oil trickling down his chin. Look around any café in Murcia in the morning and you will find that tostada con tomate is what most people are having with their coffee. Here, toasted baguette is served with a ramekin of grated fresh tomatoes and extra virgin olive oil and salt on the side, so you can add as much of each as you like. 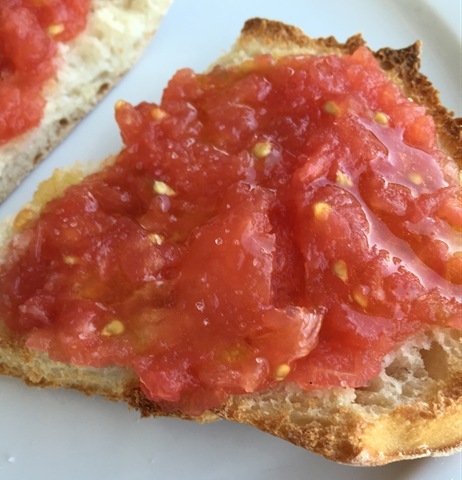 With so much greenhouse production in Spain, we actually get tomatoes (and hence tostada con tomate) year-round, but nothing beats toast made with summer garden tomatoes. 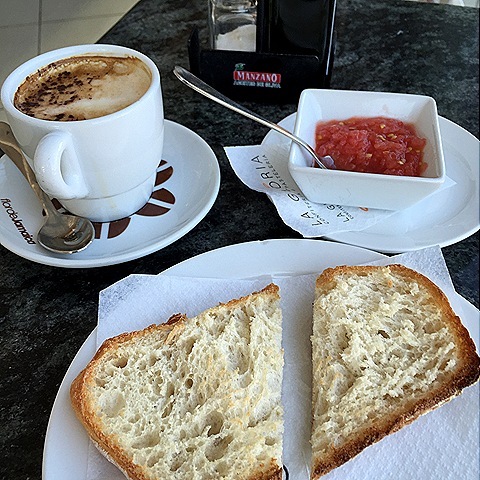 This popular breakfast and mid-morning snack (also known as pan con tomate) can be found throughout Mediterranean Spain in a variety of guises. The “best way” depends on whom you ask and where they first tasted the four basic ingredients together. Many Catalans are sure to tell you their version is the best, and the original. In Catalonia, toasted bread with tomato is known as pa amb tomàquet, which, more than a dish, is a symbol of Catalan identity. Indeed, a Catalan writer was the first to mention the preparation in writing in the 1880s, which many consider as proof of its Catalan origins. 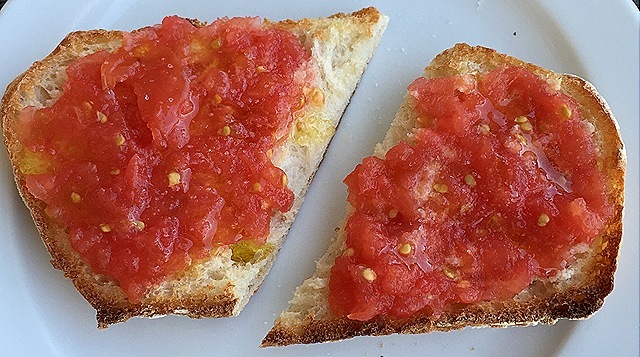 * Pa amb tomàquet is traditionally made by cutting very ripe tomatoes in half and rubbing them flesh side down onto toasted country bread (sometimes with garlic), which is then drizzled with olive oil and sprinkled with salt. For many Catalans, this is the only way to eat bread with tomato. Both the Catalan and Murcian versions (and Valencian and Andalusian takes, too) are beloved local traditions, so does it really matter which came first? I, personally, love them all, especially in the summer when tomatoes are at their best. As with any dish that has so few ingredients, quality makes a big difference in the results. It’s best to use a good baguette that won’t turn instantly soggy, the summer’s ripest tomatoes, fruity extra virgin olive oil and fine sea salt. This recipe is even a good way to use up tomatoes that may be just a little too ripe for salads. The olive oil should not be so strong that it overpowers the tomato flavor. Have the grated tomato, olive oil and salt ready on the table so they can be added soon as the toast is done. If you’d like to add protein, top with a thin slice of cured Spanish ham (or prosciutto – I feel my husband cringing – if you cannot find a Spanish brand). The quantities below are for two servings, but they can easily be multiplied or divided. Cut the tomato in half and grate each half over a shallow bowl using the large holes of a box grater (press the cut side of the tomato into the grater and rub with a flattened palm until you are down to the skin). Toast the bread enough that it has some good crunch to it. Use a fork to prick the surface of the toasted bread to help the other ingredients seep in. Top the toast with an even layer of grated tomato (thick or thin according to taste – I personally like a lot of tomato). Drizzle with extra virgin olive oil and sprinkle with salt. You can always adjust and add more as you eat. Top with ham if you like. 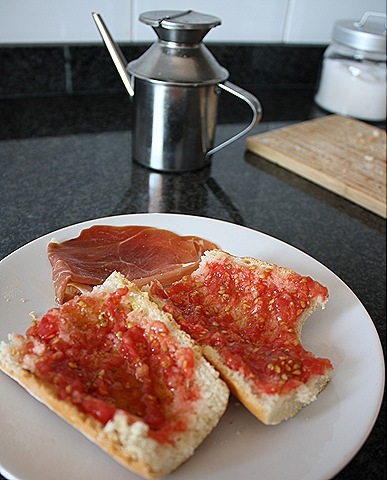 * An interesting twist: in researching the origins of this simple dish, I came across a legend that holds that it was actually workers from Murcia who introduced pan con tomate in Catalonia when they headed north to help build the Barcelona metro in the 1920s. The legend persists, even though it has been debunked by the famous Spanish food historian and gastronome Néstor Luján based on the 1880s description by a Catalan writer mentioned above. Luján believes that pa amb tomàquet originated in the Catalan countryside as a means to add moisture and flavor to dried out bread. The rest, as they say, is history ;). © 2019 Bread & Onions.